A classic round that can be used on game from groundhogs to deer with the fast projectile speed and the lower grain weight on the spectrum of high powered rifles. 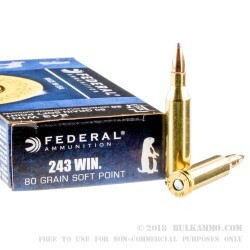 This is more projectile than a .223 Remington but offers a softer experience than some of the much bigger cartridges it still competes with on the upper end. This 80 grain soft point projectile offers an impressive range of game potential and still can reach out past the 300 yard range that most hunters find themselves needing occasionally. This is a quality round too, despite the decent price point for a round that is not in as heavy a production rotation as it once was when it was considered the go-to for medium game in past years. The boxer primed brass casing offers a chance to reload for hunters who prefer to mess around with handloads or to save a few dollars by remanufacturing their spent rounds. 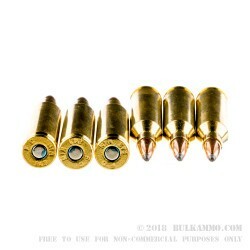 The brass is of premium quality and the round is mild in relation to some of the other high powered rounds on the market making it a very good candidate for reloading. The Federal Power-Shok projectile is a proven, capable bullet that has taken many thousands of deer in the previous decades. 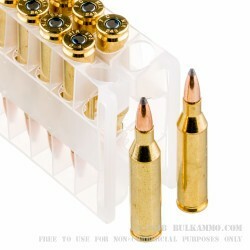 It is every bit as relevant in today’s highly engineered cartridge market as it ever was for those who recognize the potency of the caliber.